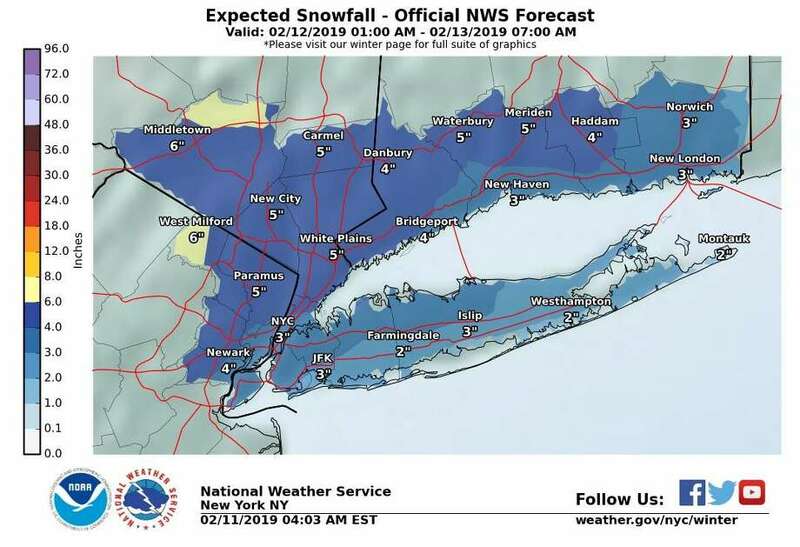 With snow, and some ice, in the foreast, the National Weather Service has issued a Winter Weather Advisory for Connecticut from 6 a.m. Tuesday to 6 a.m. Wednesday. Four to seven inches “and up,” the NWS says. The highest amounts in far northern Connecticut. The immediate shoreline could get between 3 and 4 inches. Snowfall rates are expected to be one to two inches an hour. Visibility will be less than a half-mile at times. What’s uncertain about the forecast? Timing of change over to mixed precipitation and rain. Small timing differences will have significant impacts on snowfall and ice totals. When will snow begin and end? While there is a chance of snow starting around 7 a.m., the heaviest snow is expected between 10 a.m. and 1 p.m. In southern Connecticut, the heaviest snow will fall Tuesday from 10 a.m. to 2 p.m..
Best chance of sleet - or rain - 2 p.m. to midnight. Northern Connecticut could see some freezing rain from 7 p.m. to 7 a.m. Wednesday. What does the AM and PM commutes look like? Hazardous travel due to snow and ice covered roadways and reduced visibility which will impact the morning and evening commutes. The heaviest snowfall is expected after the peak of the AM commute. Snow will turn to sleet of freezing rain by the time of the late afternoon and evening commute. There’s a good chance there will be school closings on Tuesday, especially in upstate Connecticut. Click here for the updated list of closings and delays.